INDIANAPOLIS — At the Indiana State Fair, Lt. 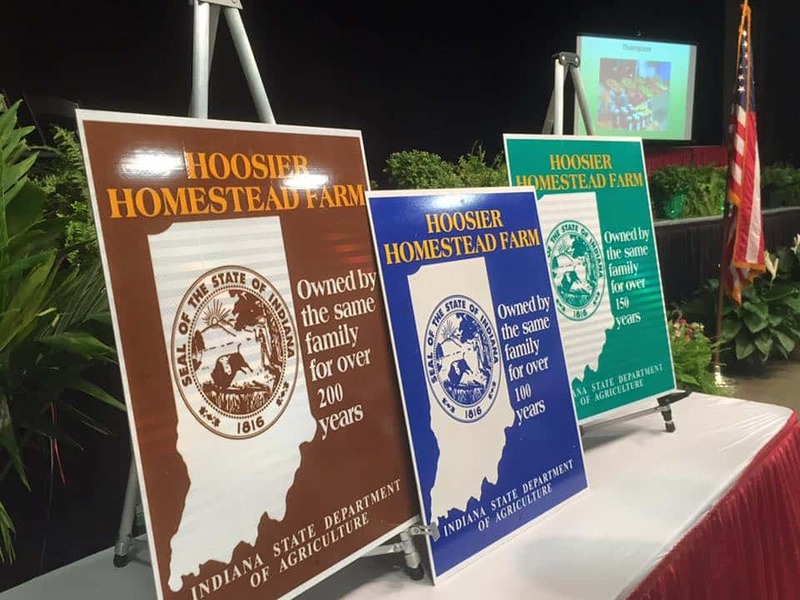 Governor Suzanne Crouch and Indiana State Department of Agriculture Director Bruce Kettler honored 88 families with the Hoosier Homestead Award for their longstanding commitment to Indiana agriculture. To be named a Hoosier Homestead, farms must be owned by the same family for more than 100 consecutive years, and consist of 20 acres or more in size or produce more than $1,000 in agricultural products per year. Families are eligible for three different distinctions of the Hoosier Homestead Award, based on age of the farm. They are Centennial (100 years), Sesquicentennial (150 years) and Bicentennial (200 years). Families are recognized semiannually — at the Indiana Statehouse in the spring and at the Indiana State Fair in the fall. For more information about the Hoosier Homestead Award program, please visit www.isda.in.gov. Photos from today’s ceremony will be posted to ISDA’s Flickr page by Wednesday, Aug. 15, 2018.